I’ve taken the MRF photo and scaled it to the exact same scale as another (larger) photo. 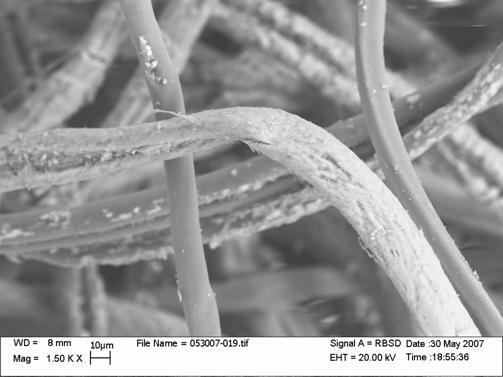 I’ve also taken two more photos and overlaid them to show detail of the “mineral” coated fiber. One image is just to the right of the middle, and the other is in the left. Note all I did here was rotate the images and moved them to similar regions. 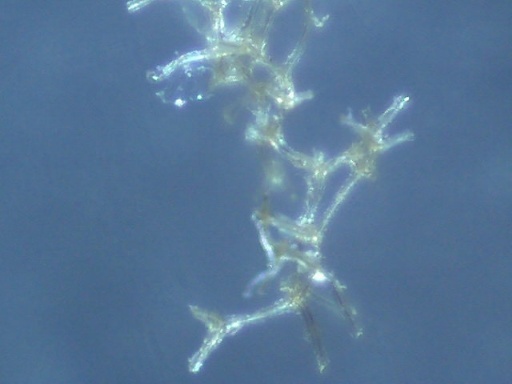 The images have been scaled to match (note the 100µm and the 10×10µm scales). 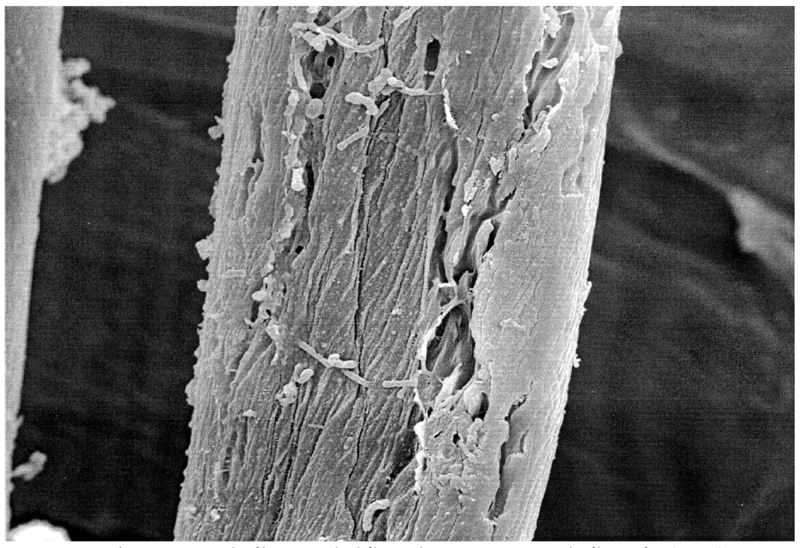 Note the undamaged fibers are the exact same size, shape and texture in both photos, while the middle damaged fiber almost exactly matches the overlaid segments of damaged fiber. All images are of cotton. 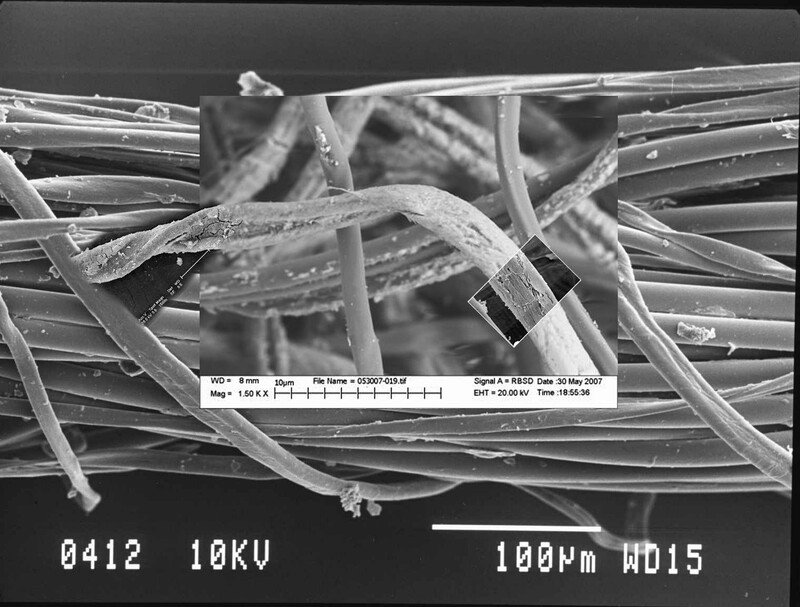 The larger background image is of cotton thread, from here, the second inset image is of a water-damaged cotton fiber from here. Click on the above photo to zoom in and examine the cotton more closely. Note that they have the exact same “minerals” sprinkled over them. 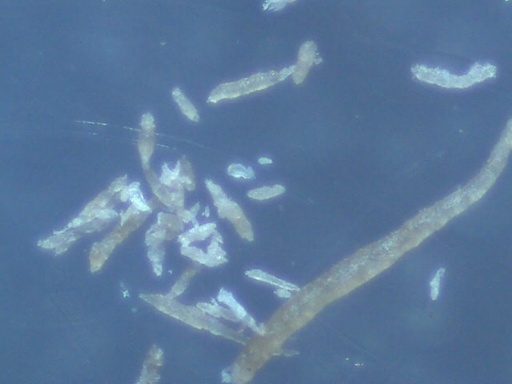 And not that the damaged fiber shows damage in the same way as the “Morgellons” fiber. Also the “faceted” fiber could quite possibly be a faceted fiber, like extruded polyester, but could equally well be a slightly twisted cotton fiber, such as those in the lower right. Hence, the most likely explanation is that these are cotton, from any of: cotton bandages, cotton wool or cotton clothing. Hardly rocket science, anyone who has been to a nightclub in the past thirty years would have noticed that white clothing fluoresces blue-white under UV lights (UV, Ultra Violet, Black Light, Woods Lamp, same thing). Particularly white cotton, including the white fibers in denim jeans. Dr. Gregory Smith wants people to know it’s not all in his head. 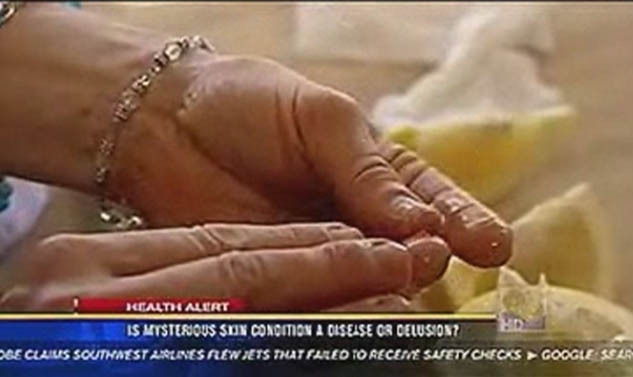 According to the Gainesville, Ga., pediatrician, white fibers have been burrowing into his skin for the past two years, making him feel like he’s under constant bombardment from insects or cactus needles. Shine a black light on these fibers and they’ll fluoresce blue, he says, just like something you’d see in The Twilight Zone. 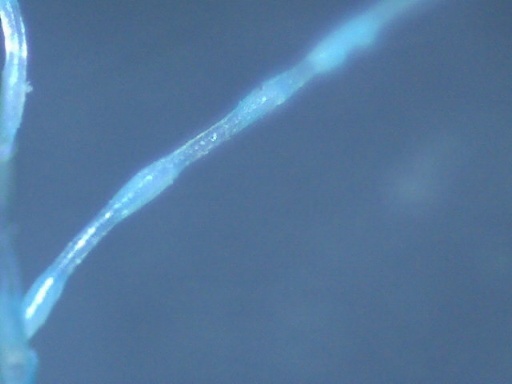 They are generally described by patients as white, but clinicians also report seeing blue, green, red, and black fibers, that fluoresce when viewed under ultraviolet light (Wood’s lamp). It all started with Mary Leitao, who “showed the doctor how the fibers glowed under an ultraviolet light”. So what’s going on here? Why does the MRF and their publicity department not know that practically all white clothing fibers fluoresce under UV light? 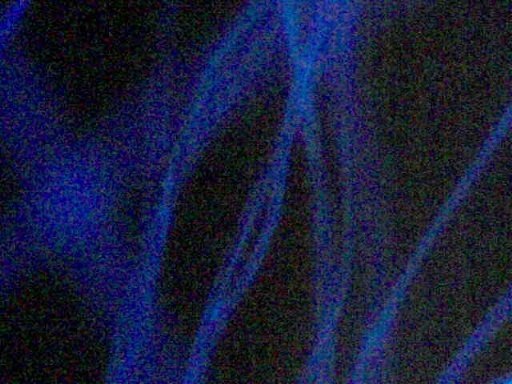 Why do they keep repeating that their fibers fluoresce as if it’s something special? If they can’t get that science right, something that is practically common knowledge, then what else might they have got wrong? 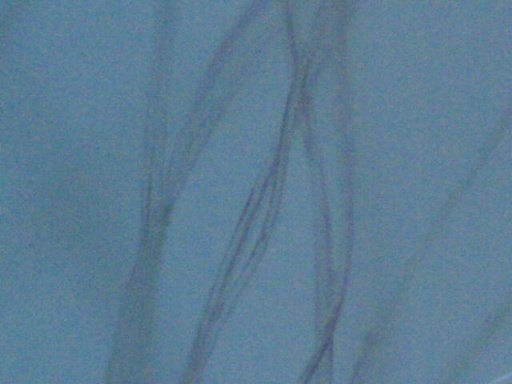 Here’s some white acrylic fibers at 200x, with normal and UV lighting. 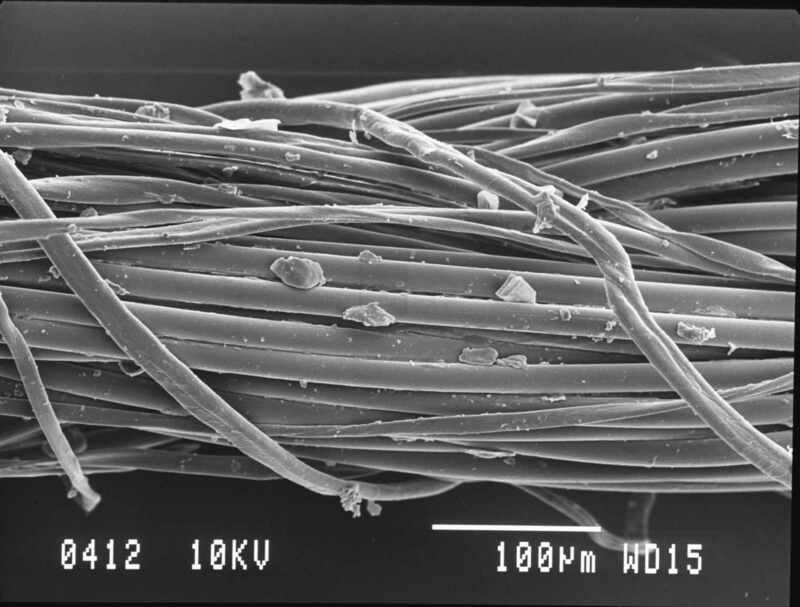 Not like something out of The Twilight Zone, just normal clothing fibers. Television likes to entertain. 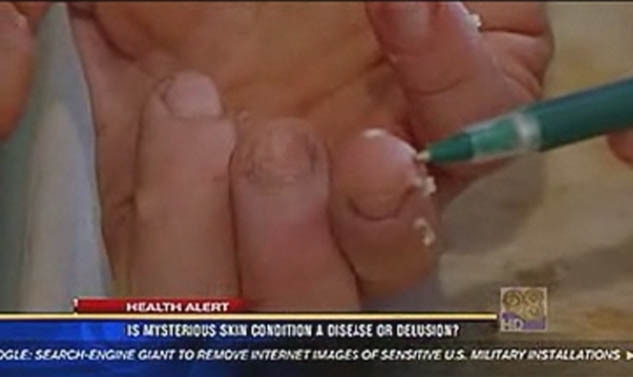 When you see television stories about Morgellons, they invariably show someone who has horrific open sores on their skin. This is very dramatic, and elicits sympathy for the sufferers, as well it should. Then, when later in the segment they trot out their “Other side of the Debate”, they imply that the doctors will say “it’s all in their heads”. The viewer might be confused at this point, since as the patient is obviously suffering from a horrible disease that causes nasty looking open sores, then how can it be all in their heads? Well, I don’t think it’s all in their heads. But the open sores do not always have an entirely physical cause. 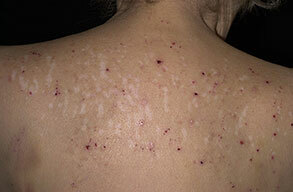 The photos show a woman’s back covered in sores and scars. They are very similar except that the one on the right has less sores and scars. Same woman, different times? No. Two different women, one of whom claims to have Mogellons, the other was diagnosed with Neurotic Excoriation. Which is which? Here’s another good example. 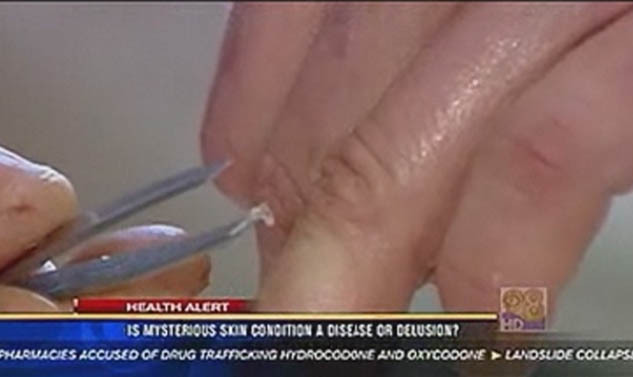 Look at the scars, and compare them to the Morgellons sufferer. I highly recommend the above article, I wish someone could show it to the producers of future news stories on Morgellons before they hurt more people with their misrepresentations in the name of entertainment.